From left, Erin Miller, Carmelle Dagmi, Executive Director David Raphael and Zoe Baruch, converse during an event at BU&apos;s Florence & Chafetz Hillel House. Around pool tables, bustling groups of Boston University students and staff chat excitedly about their first week of spring classes, then split off into prayer groups. Later on a recent Friday evening, they gather in an upstairs dining hall for a bountiful kosher meal of chicken, challah, soup, and kugel. It’s a warm, welcoming atmosphere at the university’s Hillel House, filled with renewed energy and sense of purpose. The center of Jewish life on campus and one of the university’s largest student groups, BU Hillel is in the midst of a renaissance, sparked by the arrival of a new director, an Orthodox rabbinic couple, and an array of new programs and events that have attracted a broader range of Jewish students. The surge of interest is a marked turnaround from the group’s struggles in recent years. Just two years ago, attendance had fallen off sharply, and at one point the staff was whittled down to just three. For three semesters, Hillel did not have a full-time rabbi. For a university whose Jewish population trails only New York University among US private universities, according to national Hillel officials, the situation was bleak. But in fall 2014, Hillel International, which oversees 550 Hillel chapters in the United States and abroad, tapped a new director, David Raphael, to invigorate the BU campus group. In short order, Raphael, who describes himself as a “change agent,” hired Rabbi Yehoshua Dovid Schwartz, and his wife, Chava, of OU-JLIC, an Orthodox Jewish group that serves 22 campuses in the US and Canada. “I worked to bring them in because religion isn’t the only thing we do, but it’s an anchor of who we are,” Raphael said. Raphael and the Schwartzes are working to integrate new programs and events with Hillel staples, such as Shabbat dinners and trips to Israel. Last semester, Hillel held more programs than it did all of last year, and plans to expand the offerings again this term. 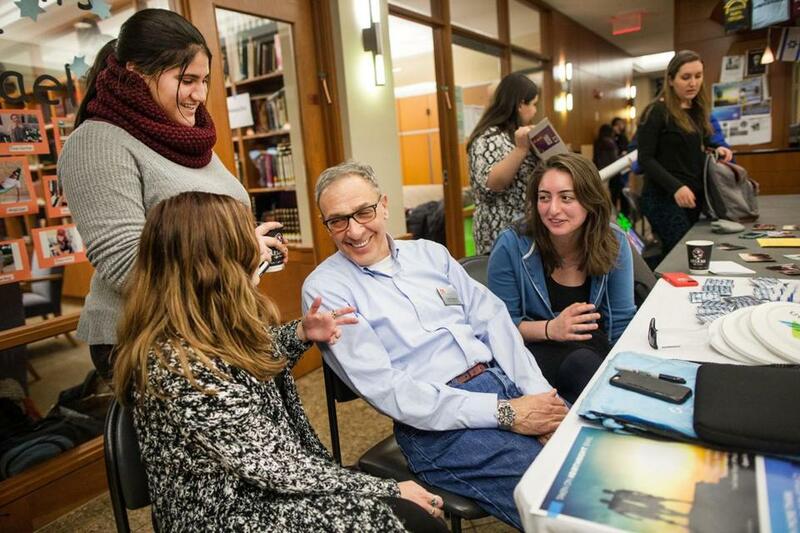 For Schwartz, spending time with college students gives him a chance to help them work through issues of faith and identity, issues that have broad implications for Judaism's future. Schwartz has provided much-needed direction to a group that had been somewhat rudderless, students said. Erin Miller, Hillel’s student president, said the resignation of numerous staff before Schwartz and Raphael arrived caused significant turmoil, and it took time for the group to rebound. “The structure wasn’t great and the more observant students were frustrated because there wasn’t a rabbi to bring in religious culture,” she said. In frustration, students reached out to Hillel International, who sent Raphael to campus. Today, there are nine staff members servicing the campus. The university’s standing in Boston’s Jewish community provides room to grow. And having a building larger than many synagogues doesn’t hurt their cause. Students say Hillel has been generally receptive to Raphael and Schwartz’s plans, although Miller says some students who had taken on leadership roles were at first reluctant to give up their res-ponsibilities. The group’s revival is most visible on Friday nights, when meals can draw more than 200 students. Schwartz estimates that Hillel reaches about one-third of BU’s Jewish students, a figure he hopes to increase by bringing programs to other parts of campus. Events have also drawn interest from students who are not Jewish, sometimes more than 20. During the recent Friday services, Schwartz made sure to spend time in both chapels discussing the week’s Torah reading, even though he is an Orthodox rabbi by training. “It’s important for each group to feel supported and accepted by the rabbi,” he says. As the evening wound down, Schwartz addressed those gathered at the dining hall, saying how good it was to have the students back on campus. As he outlined plans for the new semester, the optimism in the room was clear.